Have you cooked a roast dinner lately? We had one last weekend when my sister and her family joined us for roast turkey and all the trimmings - roast potatoes, cauliflower cheese, parsnip bake, broccoli, cranberry sauce and home-grown carrots. No, not a special occasion, though it seems that 'cooking a roast' is becoming a rarity in many households, according to recent research. The roast dinner may be as British as fish and chips but it is apparently vanishing from menus at home. Analysts say that the traditional meat and two veg (much more than two in our house!) has fallen out of the top five favourite meals. Hard to believe, I know, when my local is packed out on a Sunday with punters demanding their roast. 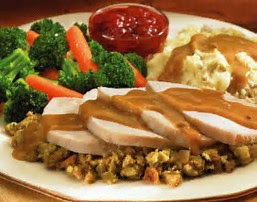 But I'm told that the number of roasts eaten has slumped by 11 per cent over the past year - that is 157 million fewer. The meal now stands at number six in the list of British favourite fayre. They must mean 'home-cooked roasts! The trade magazine, The Grocer, is reporting that vegetables are now increasingly taking centre stage at home as shoppers demand dinners that are healthier, more varied and easier to prepare. And the latter gives the game away - 'easier to prepare'. Let's face it, we are becoming a nation of lazy cooks. How many of us know how to cook a Sunday roast, from scratch? Yes, we love all the food programmes on TV, but do they inspire the British to cook? Does Jamie Oliver's 'Five Minute Meals' get you to the cooker? There is only one answer - no! We may admire the TV chef's skills in the kitchen (and enjoy the amateur cook's disasters more), but as for getting us cooking, they fail miserably. 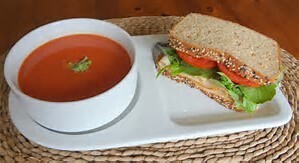 The recent study by Kantar Worldpanel on the UK's eating habits, puts sandwiches as the nation's favourite food, while soup (I doubt it's home-made) has bumped up to fifth, in front of roasts. Surely, that says it all - we are a nation of cooks that want to spend as little time as possible in the kitchen preparing food, so open a tin of soup, butter the bread and slap on a bought sandwich filling! A family meal in a 50th of the time it takes to cook a roast dinner. Thankfully, that's not the case in The Real Food Inspector's kitchen - not only is a roast a regular treat, but with so many home-grown greenhouse tomatoes at present, I think I'll make some home-made tomato soup today for lunch. Now that's Real Food!